Detached chain is also known as daisy stitch, lazy daisy stitch, tall chain stitch, loop stitch, tied loop stitch, picot stitch and knotted knot stitch, but don’t let those names lead you into thinking that the only way to use this stitch is in a flower shape. This stitch is often one of the the first that people learn as it can be used to create flowers and petals but it is not the only way you can use this stitch. 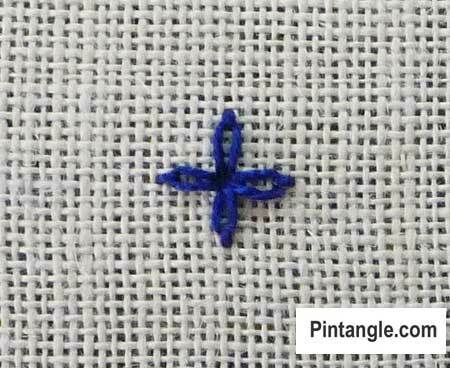 It is called detached chain because that is what it is, a single chain stitch. You can use it to create all sorts of patterns and textures for instance the sample above is stitched on hand dyed Aida cloth. Detached chain stitches are arranged in a grid and sequins are secured with a seed bead in the spaces between the stitches. It is a pattern that you can use to work on a small item such as bag or purse for instance. This sample makes a really nice border pattern. The detached chain stitches are arranged in sets of three in a fan shape. The center detached chain stitch is secured with a small chain rather than a straight stitch and I have added seed bead to the head of the stitches. The next sample is worked be over sequin waste to create a medallion pattern. Bring the needle up through the fabric and hold the thread with the left thumb. 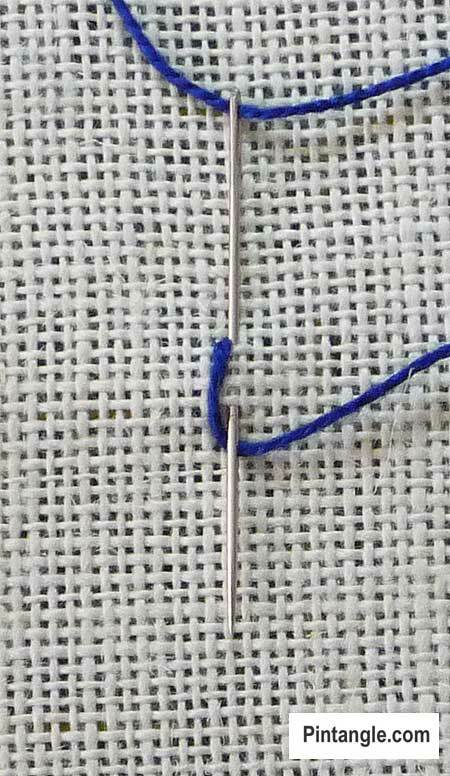 Insert the needle as illustrated, so that the point emerges a short space away. With the thread wrapped under the needle point pull the needle through the fabric. 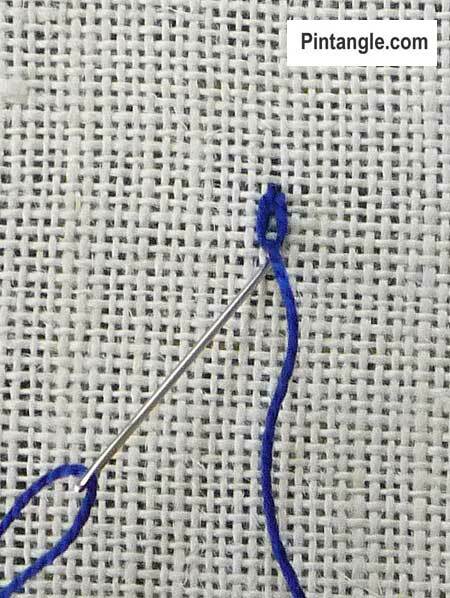 To fasten the loop make a small straight stitch. 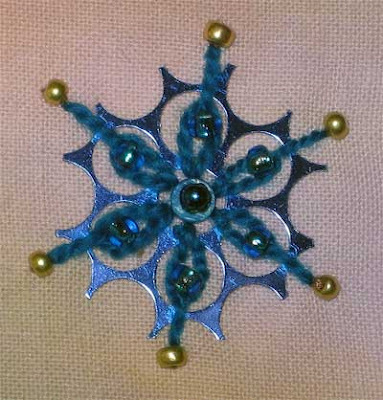 As you can see it is a stitch easily worked in a circle to create flower shapes. The next 2 samples are Detached chain used in crazy quilting. 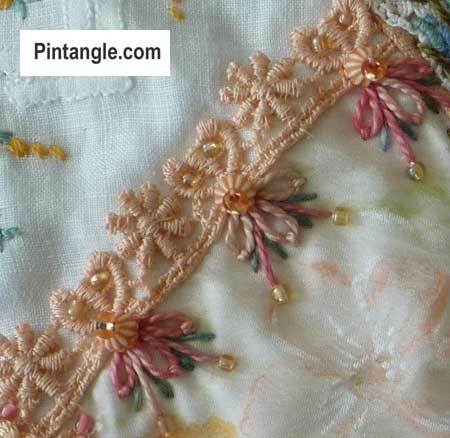 In this sample detached chain is combined with straight stitches and seed and novelty beads to work along the edge of lace. The thread I used was cotton perle #5. PS.I have had a hard time for this to post! this is the 3rd browser attempt. Catching up on Week 7's Stitch! Here's my week 7 sample – better late than never! haven't been able to do much embroidery the last few weeks… At least I'm still persevering with my sampler. Here are some pics – end of week 7. A bit disappointing, though. I'll be uploading to Stitching Fingers shortly. My daughter wouldn't let me post hers again this week… she is such a perfectionist. I'm going to have to work on her! She tried several individual stitches, and then made a little daisy out of pink perle cotton. I've just done something small for the Detached Chain Stitch, and finished the block it's on. http://so-susan.blogspot.com/2012/02/unchain-my-heart.html Nothing earth-shattering, but I'm just learning the stitches. I'm amazed and awed by the work some of you do! Hi Sharon ! I'm a new hands and it's the first time I make the tast. I love your blog, thanks for all, I can learn embroidery and english too ! I am a little late this week but please view my sampler. I am getting frustrated. I am keeping up with TAST. My camera does not want to work. GRRRRR…. When I get it fixed, there will be lots of stitches to see. A very small bit of my Tast on my blog.This is a small mixture of the past few weeks. i'm another one of those who knew this stitch as a lazy daisy. it's good to learn the proper names as we go along. Two more samples from me. It's a round-up of all the TAST stitches I've done so far in my aurica yarn. It's the same pic as the one I posted in the Flickr group. Oh this so much fun. week 7 posted on my blog. Here is my attempt at detached chain stich of the week7. Just a little bit of detached chain posted on my blog. The first stitch grandma taught me. I think of her whenever I stitch it. Here's my lazy daisy sample! My post for the week. I got my Chevron Stitch finished late, but I just finished the Detached Chain Stitch. Certainly an old favorite. Memories. Sitting on the floor with a hoop, some variegated floss and a printed pillowcases. Old songs. Chain, chain, chain of fools. Unchain my heart. I hope someone stitched those lyrics. 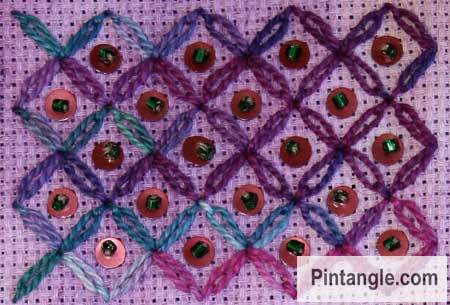 My TAST detached chain stitch for this week, Week 7. A busy week, so I've posted some photos of works in progress on which I've used detached chain stitch. There's even a beaded version. I am loving this challenge. I've got more animals this week. I see that I am not the only one who find this a favourite stitch! Easy to make, usually well-behaved and so versatile it is no wonder we all love it. I enjoyed Week 7 very much. 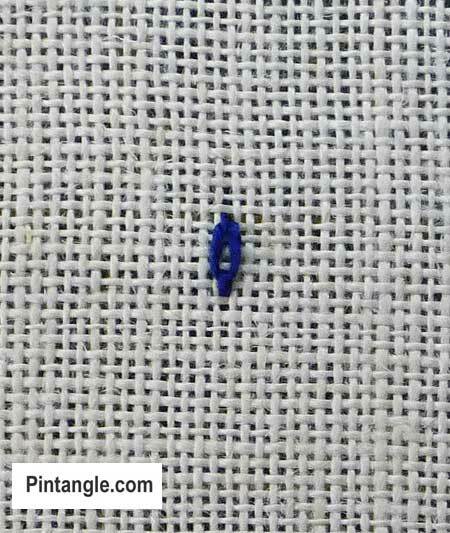 It is nice to learn a new stitch or exploring the known stitch every week. Feel like doing something useful being a home maker. Thanks for running this challenge. It looks a lot better where I used it on a crazy quilt block here: http://thatyankstitches.multiply.com/photos/album/27/CQJC2012BJP2012#photo=2 … A row of "flowers" in the top left corner and little daisies on the yellow-orange ribbon in the middle…. Here http://homemadebyme.tumblr.com/post/17656208483/tast-2012-semaine-7-detached-chain-stitch my work for this week 7. I like this work I did very much. Here are the links to some of my detached chain stitches – one of my favorites! Of course this is the first stitch i learnt long long ago. Of course a beautiful stitch. Thanks Saron B making me do various stitches by your TAST 2012 and waiting every week to know about stitches. I exihibited my old collection and like to try a new piece soon. This is definitely my favourite and I have put a piece that I completed a little while ago on my blog. It is based on a technique by Jean Littlejohn. http://christinaroland.blogspot.com/2012/02/tast-week-7.html on my blog http://christinaroland.blogspot.com/ for the results of week 7. Not my favourite stitch, but the variations are almost endless, and there are a lot of those I like. Didn't do much on that front, just used the plain detatched chain stitch in different forms. Looking forward to see other people's work. ??? ?????? ?????? ?6-7 ????? It is nice to have this detcahed chain stitch again. I worked this stitch to create patterns last time, this time around,I thought this stitch can be used on even weave cloth. still in the thinking stage. my earlier experiments with this stitch. I love this challenge! it's lending more structure to the otherwise lonely work in the studio! thank you, Sharon. I think this was probably the first stitch I used as a child, 60+ years ago – always a favourite and to me it is a daisy stitch! I'll probably add one of the old pieces and a small new one to my new narrow Sampler. Connie.